Day 2: It Started with Tenors and Zombies – The San Francisco Bay Trail: It's Closer Than You Think! Happy National Trail Day! Honestly, I had no idea that day one of my trek fell on this overlooked holiday. So today was all about celebrating a pastime that most of us have enjoyed at one time or another – walking trails – whether they are in national parks, on city boardwalks or leading us to far away peaks that reach out and touch the jet stream. Shortly after settling into my seat on the 22 Fillmore on my way to Crissy Field this morning, I heard an amazing voice, a tenor, singing gently and all too briefly. It reminded me of Harry Chapins Mr. Tanner. I looked around to see where it was coming from – it was the bus driver. The last time that happened it was my neighbor rehearsing across the hall after I moved into my first apartment in San Francisco. I knew then and there I was home. I arrived at my start point, The St. Francis Yacht Club, at 7:30 a.m. after a 10 minute walk from Bay Street and Fillmore – the final stop of the 22. As I began my hike west along Crissy Field, a few hundred runners were gathering at a starting line getting revved up for a half marathon. I am not sure how I missed it, but apparently today was the Zombie Run. Unfortunately not one of them was dressed as a zombie which was very disappointing as that would have been an image worth posting! The Mark di Suvero exhibit stood proudly along Crissy Field where it will remain until May, 2014 – the largest single exhibit of his work in one place at one time. I had the privilege of meeting Mr. di Suvero during the installation of his exhibit. It was a chance meeting that you can read more about on a page I dedicated to this experience on this website. As expected, by the time I reached the Golden Gate Bridge it was already teaming with activity as early bird cyclists made their way north to do the Paradise loop bike ride. The hordes of more tourism oriented rental bikes would follow soon enough. Fortunately the bikes use the west side and pedestrians are on the east. A typical site is someone who can barely see over the gooseneck of an oversized “mountain bike” filming video of the bridge from their iPhone as they attempt to hold a straight line down the center of the bike path. As I crossed the Golden Gate I took in a sight that never gets old – the San Francisco skyline in a misty haze backlit by the morning sun. Once over the bridge I made my way over to the west side by walking down a set of stairs to an elevated path attached to the underside off the bridge. I was soon winding my way down a road toward Fort Baker and Cavallo Point Lodge and then onto East Road. 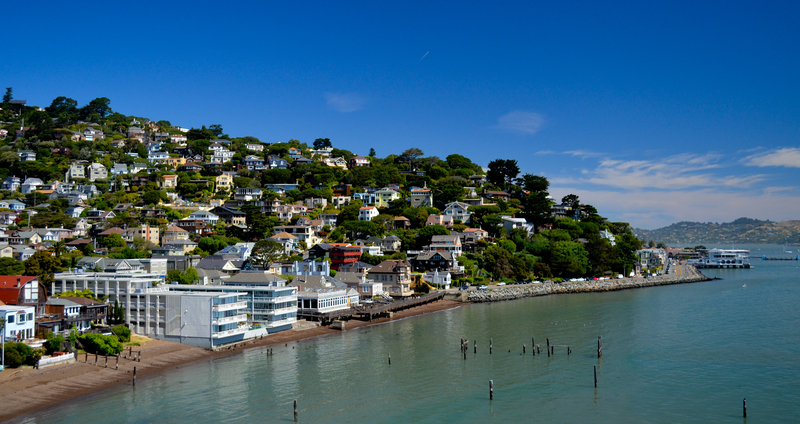 Approaching Sausalito from the south can often be like visiting Sorrento, Italy during the Giro d’Italia so I suggest staying on the sidewalk and keeping one eye on the road. The cyclists typically blaze by rather quickly as they descend the hill and wind their way into town. The hillside, dotted with a colorful and eclectic mix of dwellings intertwined among lush greenery, will be your first image of this bayside colony where the residents are often just as eclectic as the architecture.